Distance covered: 12,490 km, distance to go: 0 km – the finish! 3 C, sunny, GMT +8. Well here we go for the last train of this trip – but one seemingly without rails! 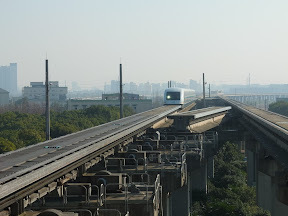 The trains depart every 15 minutes and take just 7 minutes to reach Pudong International Airport. Once I had stowed my baggage, I wandered forward to the cockpit door, which you can look through to see “the driver”. 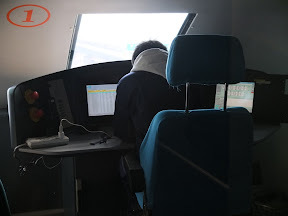 I must say it was a bit of a “Wizzard of Oz” moment, as the pilot of this train was a wearing a hoody and looked like he was working hard to improve his score on Mortal Kombat rather than preparing to take responsibility for my life on an ultra high speed rail line. After about five minutes he finished his game, sat bolt upright, adjusted his seat and hit some buttons – the doors closed, the train levitated, and we shot off towards the airport at warp speed. 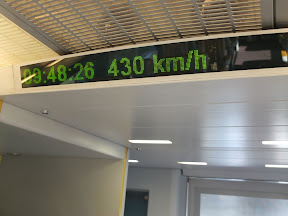 I watched the speed indicator as we accelerated up to my previous speed record from the high speed “G train” I took from Beijing last week – 300 km/h. Things start really flashing past, and this train has banked corners, so you feel a little bit more G force. But it kept on accelerating. I watched it cross 400 km/h and within a couple of minutes we had topped out at 430 km/h – briefly I was the fastest 1st class train passenger (an otherwise empty VIP class) on Planet Earth! At this speed the outside world really is a bit of a whirl. Anyway, it didn’t last too long before we edged back to 300 km/h, and quickly we arrived at the airport. I learned from my concierge at the hotel that between 9.00 and 11.00 in the morning the train reaches its top speed, but later in the day it’s about 50 seconds slower on the run, to save power apparently.. I found Pudong Airport a bit like Heathrow – not very friendly to a transferring passenger carrying baggage, but was pleased I had done this trip rather than take a taxi the whole way. As many say, it’s a bit of a shame this line does not go all the way into the city, but its still well worth using. So there we go, a 12,490 km journey over three weeks which I would definitely commend to you. I hope you have enjoyed my posts and found them informative, especially if you are considering doing this trip yourself. I also hope you have found them amusing if you are not planning to do this trip, but know me, and were perhaps hoping I might get detained in a gulag! I have tried hard to present my experiences in an honest and straightforward way – it’s a journey that needs a fair amount of planning to work through the red tape, but once on the rails, a real adventure. It’s not hard, but does need one to remain open minded and live in the moment of the biggest train trip out there. 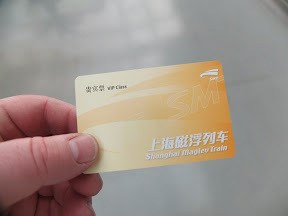 I will not be posting further on my continuing travels in Asia, as they don’t employ the train, the subject of this blog. I will however post more on kit reviews and image galleries whilst its all fresh in my mind. Thanks Matthew, it's been a real pleasure trying to keep up with you. I shall miss your Blog. I hope, when you read someone else's in a few years, that it brings back your memories the way your Blog has worked for me. Truly an experience of a lifetime Mr T , As Mr Worrod has already said , " Its been a real pleasure trying to keep up with you " and i will miss your blog also . What you have just experienced has always been a lifetime ambition of mine , i have always had a fascination for Russia , Siberia and the Mongol region . My utimate dream would be to follow your footsteps in an old Citroen 2cv . What a challenge . Congratulation on your success Mr T and also on your splendid blog . Thoroughly enjoyed it .I raise a glass to you . Kind regards , OT . Glad you enjoyed my trip Sir! Hi Mr OT – Glad you enjoyed it! I think a 2CV in winter might be challenging – your would need a trailer to carry all the coal and fuel! I too have been having difficulty commenting. Have lost several comments in the ether and lost the will to retrieve them. Your blog has been the subject of many discussions over the holidays. Very inspirational and great fun. Love the details of how to get from carriage to carriage- with good gloves! Enjoy Vietnam Rob! But don't leave your Trans-Siberian adventure too long. Why not do both – train from Shanghai via Kunming to Hanoi?! I think its possible but have not checked at Seat61.. Thanks for a really good read. As someone planning on following the same Trans-Siberian route I have found it completely engrossing. I had a couple of questions, especially as you've managed to maintain blogging so regularly. Did you find sockets to charge from easily enough or did you use your solar/battery charger much? Also, were you blogging from wifi in the stations along the route? Hi. 230v socket in each First Class compartment but not in Second Class – they fused occasionally but can be reset in the guards compartment. Corridor sockets are lower amps and not powerful enough to recharge a laptop – but might do a phone.. If you are in Second Class it would be worth having the Power Gorilla.. I had no Wi-Fi between Moscow and Beijing but wrote and saved my blog each day – in this way it keeps a diary feel around the real timeline. I didn't try 3G but figured it would cost a fortune as I didn't have a local SIM card. Best if luck with your trip.